A group of local chefs, entertainers and food and beverage industry professionals will stage “Chefs For Hope,” a fundraiser for survivors of the devastating Typhoon Haiyan in the Philippines. Confirmed participants include 12th Ave Grill, Alan Wong’s, the Beachhouse at the Moana, Cafe Laufer, Centerplate, d.k Steakhouse, HASR Bistro, Hawaiian Spring Water, Hiroshi’s, Japengo, JJ Bistro & French Pastry, Kakaako Kitchen, La Tour Cafe, Mariposa, Michel’s at the Colony Surf, Morimoto, Nico’s, Nori’s, Ola at the Turtle Bay Resort, Paradise Beverages, Poke Stop, Rakuen Sushi Bar/Mercury Pub, Roy’s, SALT, Sansei Sushi Bar & Restaurant, Side Street Inn, Southern Wine & Spirits, Tango Contemporary Cafe, The Pacific Club and World Sake Import Beverages. 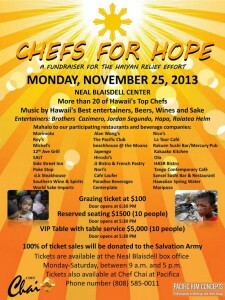 The event will be held Monday, Nov. 25 at the Neal Blaisdell Center. VIP tables of 10 cost $5,000; reserved seating for 10 is priced at $1,500; and $100 for individual grazing tickets. One hundred percent of ticket sales will be donated to the Salvation Army. Doors open at 5:30 p.m. for VIP and reserved seating, and 6:30 for general admission. 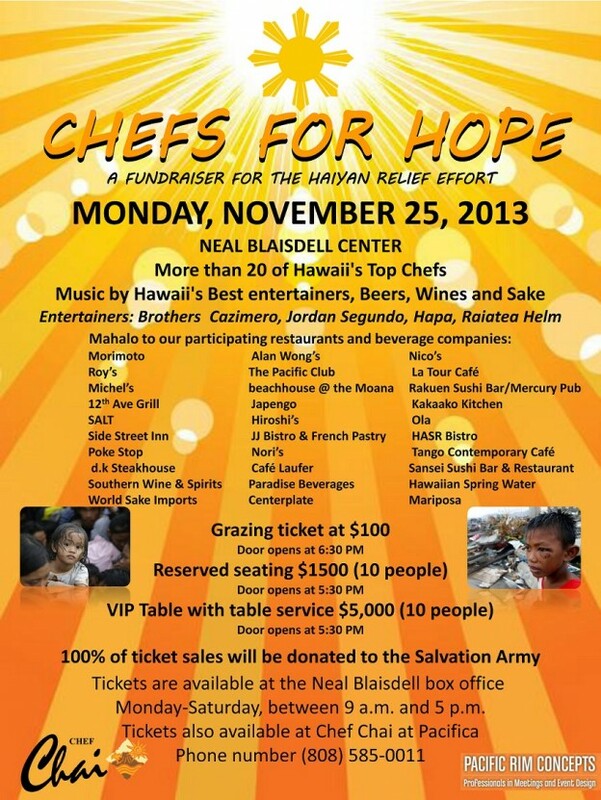 Tickets are available at the Neal Blaisdell Box Office Monday-Saturday, between 9 a.m. and 5 p.m. and at Chef Chai at Pacifica. For more information, call 585-0011. Event sponsors include Accel Rentals, Current Affairs, Events International, Hon Graphics, Nursery Associates, Pacific Rim Concepts, LLC and Royal Party Rentals. Payment Accepted by cash, Visa, Master Card, Discover, and American Express. No feen selling Hard Tickets.